Split, the second biggest city of Croatia with 200.000 inhabitants, is an important cultural, tourist, trade, industrial, administrative, and, particularly sport centre of Dalmatia. The town of Split was founded in the late third century, when the Roman emperor Diocletian built his palace here, leaving to the town its unique heritage of breathtaking architecture. A thousand-seven-hundred-years old Diocletian´s palace is subject to the world cultural heritage protection. Most of the hotels in Split are situated in walking distance from city center and all of the 5* hotels are newly built and meets highest standards. There are high quality hotels operating within world known chains. 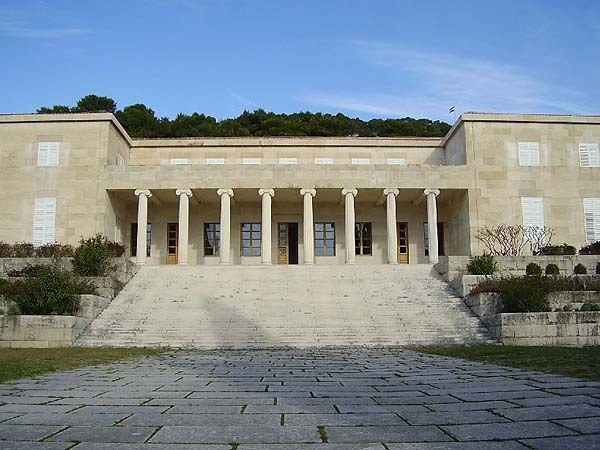 The Mestrovic Gallery is housed in the magnificent mansion built from 1937-1939 as a home/atelier for Croatian sculptor Ivan Mestrovic and his family. The house and garden hold some of the artist’s best work, from all of his phases, including a pair of huge walnut Adam and Eve figures and the powerful bronze Cyclops. Bronze sculptures are on display in the park and artworks out of marble, stone, wood, bronze, oil paintings and an assortment of drawings are on display in the halls of the gallery. 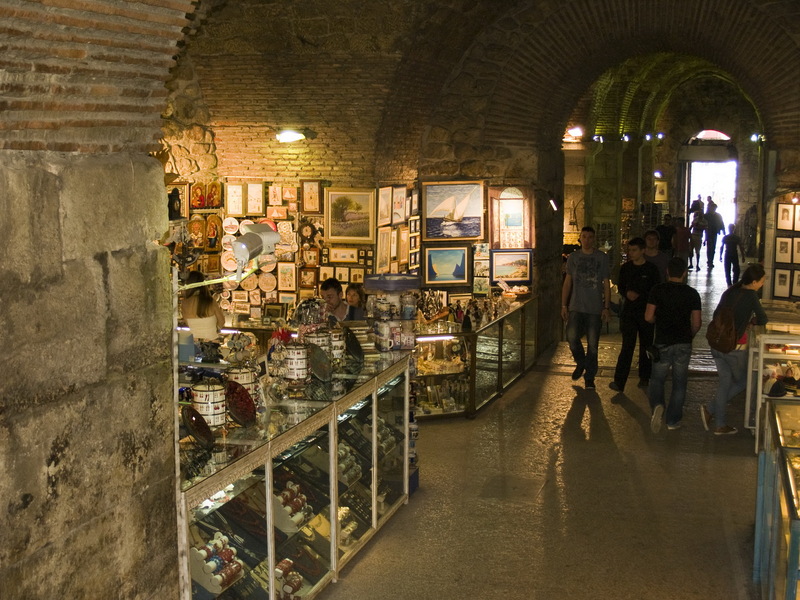 The architectural purpose of this well preserved cellar of Diocletian’s Palace was to raise the imperial residential area in the upper floor. In the early Middle Ages a part of it was inhabited, and in one of the hall olive oil and wine were manufactured. The cellars are still in function today. 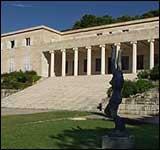 Art exhibitions and theatre plays are regularly organised here, together with all kind of diverse events. Split is the largest and most important town in Dalmatia. The town was developed around the palace, which was erected by the Roman Emperor Diocletian in the 4th century. Diocletian’s palace, todays heart of inner city of Split is part of UNESCO world heritage. 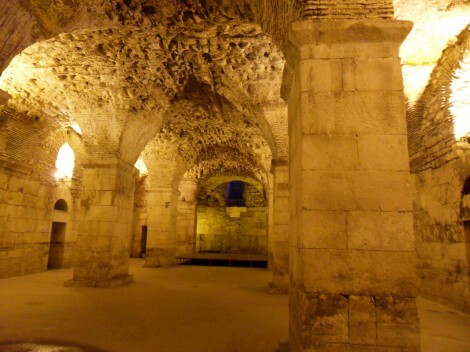 Visit the well preserved cellars of Diocletian’s Palace, Peristil and Temple of Jupiter. Admire the Cathedral of St Duje (St Duje is patron of the Split), which is of all cathedrals in Europe housed in the oldest structure - the mausoleum of Diocletian. The historical core of Trogir is a unique monument of culture, which is included in UNESCO’s World Heritage List. Lovers of cultural and historical monuments, art and architecture have the opportunity to learn about manifold and complex heritage – from Romanesque yard to the modern interiors. The unique historical core, Cathedral St. Lawrence, Radovan’s portal and sumptuous art collections have been arousing excitement among visitors and travellers for centuries. Sibenik is a town which was first mentioned in 1066, in a document issued by King Petar Kresimir IV. Have a look at its main attraction - the Jewel of the Dalmatian coast, St. Jacob’s Cathedral, from 15th c, built by Juraj Dalmatinac, whose statue, the work of the famous Croatian sculptor Ivan Mestrovic, stands on the square. Contine towards the National Park Krka –situated on the area of of 142 km2. NP Krka is known after Krka waterfalls and the Franciscan monastery on the island Visovac situated in the middle of Visovac lake. Krka National Park encircles the Krka river and its deep canyons. Krka is the most amazing of all rivers in Dalmatia, surrounded by untouched nature, enjoying the sights of crystal clear waters, waterfalls and numerous small lakes. Go through the path of history, first to Solin and after to its archaeological site called Salona. Solin was first mentioned in 119 BC as the centre of the Iliyrian tribe of Dalmata. Short walk on the promenade along the Jadro river, surrounded with trees and parks. In St. Mary's Church fragments of the queen Jelena's sarcophagus was found - bearing an inscription classified as one of the most important record from the period of the early Croatian history. Today, Salona is the most important archaeological site in Croatia and South-eastern Europe with preserved archaeological remains from Roman, early Christian and early medieval period. Walk around the remains of amazing temples, amphitheatres, first-century baths, early Christian churches and burial grounds. Omis is known as a medieval pirate centre. The well preserved fortresses Mirabella and Fortica bear witness to the pirate history of the town. The remains of the medievel fortifications include the town gate, the tower on “Fosal”, the fortification on the cliff above town and the ruins of the fortress Fortica on the hill above Omis (311m). After sightseeing enjoy a sailing cruise on Cetina river whose power was used for mills first mentioned in the 17th century.